In Numbers 22 yesterday, we were introduced to the Moabite King named Balak. He was afraid. Knowing what the Israelites had just finished doing to the Amorites, King Balak and his people were distressed as they looked out and saw thousands of Israelites camped on the plains of Moab. As any good leader would do, Balak took action. He sent for Balaam, a “diviner” with an impressive track record, to help him take care of the situation. “Come now, curse this people for me, since they are too mighty for me. Perhaps I shall be able to defeat them and drive them from the land, for I know that whom you bless is blessed, and he whom you curse is cursed” (Numbers 22:6). Balaam set out on a donkey, but God sent angels to block the way. Balaam was frustrated and beat the donkey because it wasn’t going where he wanted it to go. 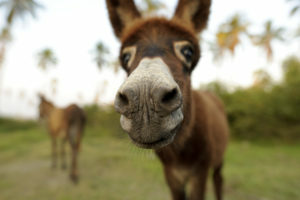 THEN, God opened the donkey’s mouth and he started talking to Balaam! (What, a talking donkey? This sounds like a bad television show.) After the donkey made Balaam feel bad for the beating, God opened Balaam’s eyes to see an angel of God standing in the donkey’s way. Balaam fell on his face. While he offered to change direction / to turn back and not go to meet King Balak, the angel affirmed God’s earlier instruction, “And the angel of the Lord said to Balaam, “Go with the men, but speak only the word I tell you (Numbers 22:35). So far so good, Balaam is still getting what he wants! When we get to Numbers 23, Balaam has King Balak set up alters and offer sacrifices to God. But the outcome was not a curse on the Israelites like King Balak requested. Rather, having to speak the words God instructed, Balaam blessed the people of Israel. Four times King Balak requested a curse and received a blessing in return. By the end of Numbers 24, Balaam and Balak part ways. God is sovereign – The plans of influential and powerful men, like King Balak, will not prosper without the Lord’s permission. Many are the plans in the mind of a man, but it is the purpose of the Lord that will stand, (Proverbs 19:21). God uses a variety of means to accomplish his purpose – In Numbers 22-24, God used both a pagan sorcerer and a talking donkey to accomplish his plan. “For my thoughts are not your thoughts, neither are your ways my ways, declares the Lord. For as the heavens are higher than the earth, so are my ways higher than your ways and my thoughts than your thoughts”, (Isaiah 55:8-9). Outward appearances aren’t enough – Balaam gave the impression he was God’s prophet; he had King Balak build alters and offer sacrifices to God; he spoke God’s words of blessing on the Israelites. But make no mistake about it, he was clearly in it for himself. Later in Numbers, we will see Balaam wreak more havoc on the Israelites. Unfortunately he never truly put his faith in God. For the LORD sees not as man sees: man looks on the outward appearance, but the LORD looks on the heart (I Samuel 16:7). This last key lesson is where I think the rubber meets the road for many of us. Remember, God’s plan for salvation requires us to take action. …if you confess with your mouth that Jesus is Lord and believe in your heart that God raised him from the dead, you will be saved. For with the heart one believes and is justified, and with the mouth one confesses and is saved, (Romans 10:9-10). It isn’t enough to be a good person, to go to Church, to say the right things, to “hang out” with God and to sound godly. God requires more. He has told you, O man, what is good; and what does the Lord require of you but to do justice, and to love kindness, and to walk humbly with your God (Micah 6:8-11). God requires our hearts. And you shall love the Lord your God with all your heart and with all your soul and with all your mind and with all your strength (Mark 12:30).